With excellent views across Birmingham city centre, these modern Saco apartments have free Wi-Fi and a balcony or terrace. Set in the Brindleyplace, bars cafes and shops are just outside. Each luxury serviced apartment at SACO @ Livingbase - Brindleyplace has a fully fitted kitchen featuring an oven and hob, microwave, kettle and kitchenware. With access to a balcony, the spacious living/dining area includes a flat-screen satellite TV, DVD and CD player. 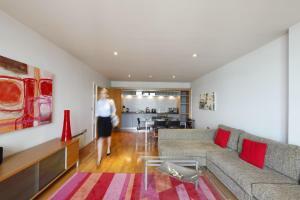 It has sleek décor, wooden floors and sofas. Each bedroom has a private bathroom. In the heart of the city's Convention Quarter, the International Conference Centre is a 5-minute walk away. The National Sea life Centre and National Indoor Arena are 5 minutes’ walk and Birmingham New Street Station is a 15-minute walk away. Please note that guests must be over 25 years old. At check-in, you will need the credit card used during booking and a form of ID (e.g. driving license or passport). The property has the right to deduct money from the card used to book the accommodation, to cover any damages. Guests should be aware that a GBP 500 deposit may be taken at the time of booking.